This article is about the general definition of par on a golf hole. For the specific scoring system, see Par (golf scoring format). In golf, par is the predetermined number of strokes that a scratch (or 0 handicap) golfer should require to complete a hole, a round (the sum of the pars of the played holes), or a tournament (the sum of the pars of each round). Pars are the central component of stroke play, the most common kind of play in professional golf tournaments. The term is also used in golf-like sports such as disc golf, with the same meaning. The length of each hole from the tee placement to the pin mostly determines par values for each hole. Almost invariably, holes are assigned par values between three and five strokes, which includes the drive and two putts. For a casual player from the middle tees, a par-three hole will be 100–250 yards (90–230 m) from the tee to the pin. Par-four holes are 250–470 yards (230–430 m), but tournament players will often encounter par-four holes 500 yards (460 m) or more, as it is common for short par-five holes for normal play to be turned into par-four holes in championship play. Par-five holes are typically 470–600 yards (430–550 m), but in the modern game holes of over 600 yards are becoming more common in championship play. Other relevant factors in setting the par for the hole include the terrain and obstacles (such as trees, water hazards, hills, or buildings) that may require a golfer to take more (or fewer) shots. 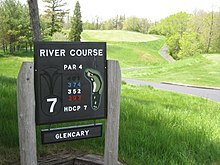 Some golf courses feature par-sixes and, very rarely, par-sevens, but the latter are not recognised by the United States Golf Association. Typical championship golf courses have par values of 72, comprising four par-threes, ten par-fours, and four par-fives. Championship course par can be as high as 73 to as low as 69. Most 18-hole courses not designed for championships have a par close to 72, but some will be lower. Courses with par above 73 are rare. Courses built on relatively small parcels of land will often be designed as "Par-3 Courses" in which every hole (or almost every hole) is a par-three (for a total par of 54 or slightly higher over 18 holes). A golfer's score is compared with the par score. If a course has a par of 72 and a golfer takes 75 strokes to complete the course, the reported score is +3, or "three-over-par" and takes three shots more than par to complete the course. If a golfer takes 70 strokes, the reported score is −2, or "two-under-par". Tournament scores are reported by totalling scores relative to par in each round (there are usually four rounds in professional tournaments). If each of the four rounds has a par of 72, the tournament par would be 288. For example, a golfer could record a 70 in the first round, a 72 in the second round, a 73 in the third round, and a 69 in the fourth round. That would give a tournament score of 284, or "four-under-par". Scores on each hole are reported in the same way that course scores are given. Names are commonly given to scores on holes relative to par. Bogey means one shot more than par (+1). "Going round in bogey" originally meant an overall par score, starting at the Great Yarmouth Golf Club in 1890, and based on the phrase "bogey man" and a popular music hall song Here Comes the Bogey Man. Notionally, players competed against Colonel Bogey, and this gave the title to a 1914 marching tune, Colonel Bogey March. As golf became more standardised in the United States, par scores were tightened and recreational golfers found themselves scoring over par, with bogey changing meaning to one-over-par. Bogeys are relatively common, even in professional play, and very common for many casual and club players. More than one shot over par is known as a double-bogey (+2), triple-bogey (+3), and so on. However, it is more common to hear scores higher than a triple bogey referred to simply by the number of strokes rather than by name. For example, a player having taken eight shots to negotiate a par-three, would be far more likely to refer to it as an "eight" or being "five-over-par", rather than a "quintuple-bogey". Double-bogeys and worse scores are uncommon for top performers in professional play. It is considered somewhat noteworthy if a player manages to complete a bogey-free round. Scoring four bogey-free rounds in a tournament is extremely rare. Examples are Lee Trevino at the 1974 Greater New Orleans Open; David J. Russell at the 1992 Lyon Open V33; Jesper Parnevik at the 1995 Volvo Scandinavian Masters; Manuel Piñero at the 2002 GIN Monte Carlo Invitational; Diana Luna at the 2011 UniCredit Ladies German Open; and Jonas Blixt and Cameron Smith at the 2017 Zurich Classic of New Orleans (a team event). Each of them won the tournament except Piñero, who finished third. Par means scoring even (E). The golfer has taken as many strokes as the hole's par number. In theory, pars are achieved by two putts, with the remaining shots being used to reach the green. Reaching the green in two strokes fewer than the hole's par is called achieving a "green in regulation". For example, to reach the green of a par-five hole in regulation, the player would take three (or fewer) strokes, with the other two strokes allocated for putting the ball into the hole. Par derives its name from the Latin for equal. Birdie means scoring one under par (−1). This expression was coined in 1899, at the Atlantic City Country Club in Northfield, New Jersey. According to a story that has been passed down, one day in 1899, three golfers, George Crump (who later built Pine Valley Golf Club, about 45 miles away), William Poultney Smith (founding member of Pine Valley), and his brother Ab Smith, were playing together when Crump hit his second shot only inches from the cup on a par-four hole after his first shot had struck a bird in flight. Simultaneously, the Smith brothers exclaimed that Crump's shot was "a bird". Crump's short putt left him one-under-par for the hole, and from that day, the three of them referred to such a score as a "birdie". In short order, the entire membership of the club began using the term. As the Atlantic City Country Club, being a resort, had many out-of-town visitors, the expression spread and caught the fancy of all American golfers. The perfect round (score of 54 on a par-72 course) is most commonly described as scoring a birdie on all 18 holes, but no player has ever recorded a perfect round in a professional tournament. During the 2009 RBC Canadian Open, Mark Calcavecchia scored nine consecutive birdies at the second round, breaking the PGA Tour record. Eagle means scoring two under par (−2). An eagle usually occurs when a golfer hits the ball far enough to reach the green with fewer strokes than expected. It most commonly happens on par-fives but can occur on short par-fours. A hole in one on a par-three hole also results in an eagle. The name "eagle" was used as a large bird representing a better score than a birdie. Albatross means three shots under par (−3) (the albatross being one of the largest birds); also called a double eagle in the US. It is an extremely rare score and occurs most commonly on par-fives with a strong drive and a holed approach shot. Holes-in-one on par-four holes (generally short ones) are also albatrosses. The first famous albatross was made by Gene Sarazen in 1935 on the 15th hole at Augusta National Golf Club during the final round of the Masters Tournament. It vaulted him into a tie for first place and forced a playoff, which he won the next day. The sportswriters of the day termed it "the shot heard 'round the world". Between 1970 and 2003, 84 such shots (an average of fewer than three per year) were recorded on the PGA Tour. Recent well-publicised albatrosses include those by Joey Sindelar at the 2006 PGA Championship, only the third in that competition's history, Miguel Ángel Jiménez while defending his BMW PGA Championship title in 2009, Paul Lawrie in the final round of the 2009 Open Championship, Shaun Micheel on the final day of the 2010 U.S. Open, only the second ever in that competition, Pádraig Harrington in the 2010 WGC-HSBC Champions, Louis Oosthuizen on the final day of the 2012 Masters Tournament, the fourth in that competition's history and the first to be televised and the first on Augusta's par-five-second hole, Rafael Cabrera-Bello at the 2017 Players Championship, and Brooks Koepka at the 2018 Players Championship. Condor is an unofficial name for a score of four under par (−4). This is the lowest individual hole score ever made. A condor would be a hole-in-one on a par-five (typically by cutting over a dogleg corner), a two on a par-six or a three on a par-seven (neither of which has ever been achieved as of December 2016). Par-sixes are exceptionally rare, as are par-sevens. As of October 2008, a condor had been recorded only four times, once reportedly on a straight drive (a record 517 yards or 473 metres, aided by the thin air at high altitude in Denver) and never during a professional tournament. One condor was reportedly achieved with a 3-iron club (in 1995 on a horseshoe-shaped par-5 hole). A condor is also known as a double albatross, or a triple eagle, and the convention can, in principle, be extended to name other hypothetical scores such as five under par. ^ Drane, Dan; Block, Martin E. (2005). Accessible golf: making it a game fore all (Illustrated ed.). Human Kinetics. ISBN 978-0-88011-979-5. Retrieved June 6, 2011. ^ a b "Scottish Golf History—From Bogey to Blow-Up: Bogey". ScottishGolfHistory.net. 2003–2007. ^ Harris, Ed (2007). Golf Facts, Figures & Fun. Illustrated. AAPPL. ISBN 978-1-904332-65-7. ^ "Bogey-free Luna makes history in Germany". Ladies European Tour. May 25, 2011. ^ Price, Charles (1962). The World of Golf. p. 124. Price's book is required reading for all membership applicants to the PGA. ^ "Atlantic Cite: On to the Next Round". The New York Times. May 10, 1998. ^ "Atlantic City Country Club; A golf landmark goes public". Golf Digest. June 2008. ^ "Calcavecchia birdies record 9 straight holes". Golf Magazine. Associated Press. July 25, 2009. ^ Fields, Bill (April 2, 2004). "The Rarest Bird: The albatross took flight at the 1935 Masters, but golf's most unlikely shot isn't easy to find". Golf World. Archived from the original on March 5, 2007. ^ "Sindelar plunders rare albatross". BBC. August 19, 2006. Retrieved September 9, 2018. ^ "Casey holds on for Wentworth win". BBC. May 24, 2009. Retrieved September 9, 2018. ^ "Lawrie enjoys albatross at Open". BBC News. July 19, 2009. Retrieved May 21, 2010. ^ Editorial, Reuters. "Golf-Micheel records second ever U.S. Open albatross". ^ Keogh, Brian (November 6, 2010). "News: Albatross not enough for Harrington". Irish Golf Desk. Retrieved October 1, 2012. ^ "BBC Sport 2012 Masters: Day four as it happened". BBC Sport. April 9, 2012. Retrieved October 1, 2012. ^ "ESPN Brooks Koepka makes albatross, ties TPC record with 9-under 63". ESPN. May 13, 2018. Retrieved May 13, 2018. ^ a b c d "Condor". Golf Today. October 2008. ^ Kelley, Brent. "Par 6 (Par-6 Hole)". About.com Golf. Retrieved August 24, 2014. As noted, par-6 holes are rare, with most golf courses having only par-3, par-4 and par-5 holes. Most recreational golfers go their entire golfing careers without ever seeing a par 6. ^ "Farmstead Golf Links, Calabash". North Carolina Course Reviews. Worldgolf.com. January 29, 2002. Retrieved October 1, 2012. ^ Robb, Victoria (April 13, 2007). "The World's Longest Golf Hole". Esquire. Retrieved December 25, 2014. According to The Guinness Book of World Records, the Satsuki golf course in Sano, Japan, boasts the longest hole in the world—an exhausting 964-yard, par-7 humdinger. ^ Aumann, Mark (September 7, 2014). "Par-7, 1,100-yard hole provides challenge to long hitters in South Korea". PGA of America. Retrieved December 25, 2014. ... Gunsan's par-7, 1,100-yard third hole ... Gunsan Country Club ... has some of the longest golf holes in the world, including a Par 7 hole (1,004m) and a Par 6 hole (661m). ^ a b Kelley, Brent. "Has There Ever Been a Hole-in-One on a Par-5 Hole?". About.com Golf. Retrieved August 24, 2014. One was even recorded with a 3-iron! That one was made by Shaun Lynch, playing at Teign Valley Golf Club in Christow, England, in 1995, on the 496-yard No. 17. According to a 2004 article in Golf World magazine, Lynch aimed straight toward the green on a horseshoe par-5, clearing a 20-foot-high hedge, then hitting a downslope on the other side. The downslope carried his ball to the green and into the cup.